1. 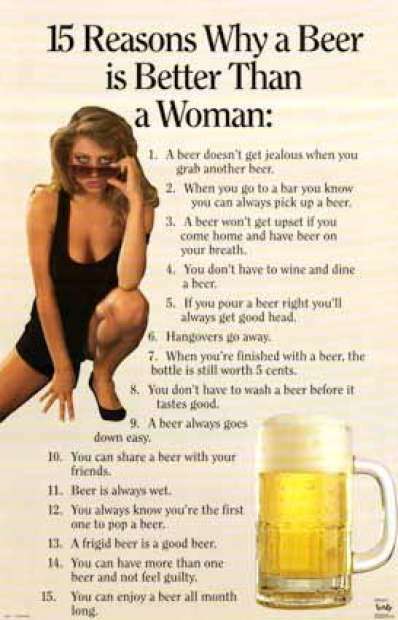 Beer is always wet. 2. Frigid beer is good beer. 3. Beer never gets a headache. 4. Beer always goes down easily. 5. You can share a beer with all your friends. 6. You don’t have to wine and dine beer. 7. You can enjoy beer every day of the year. 8. You always know you are the first one to pop a beer. 9. You don’t have to wash a beer before it tastes good. 10. You can have more than one beer and not feel guilty. 11. Beer doesn’t get jealous when you grab another beer. 12. 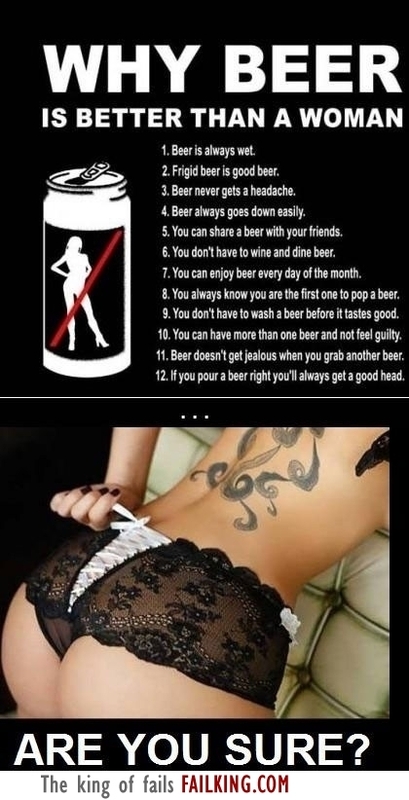 If you pour a beer right you’ll always get good head. 13. When you go to a bar, you know you can always pick up a beer. 14. A beer won’t get upset if you come home and have beer on your breath. 16. When you’re finished with a beer, the bottle is still worth 5 cents. editor’s note: some people will find this post offensive but to me it’s funny as all get out, and if you can’t laugh and see the humor in it, then I apologize in advance.